← Question #2: Psalm singing was part of the Old Testament temple worship. If the temple has been abrogated, how do we know that the Psalms have not been abrogated as well? This entry was posted in Questions and tagged Exclusive Psalmody, Jews, Synagogue, worship. Bookmark the permalink. The following is from Chapter 9 of The Psalms in Worship, edited by John McNaugher, D. D., LL. D., 1907. Chapter 9 is titled The Psalms in the Old Testament Church, by Professor DA McClenahan, D. D., Allegheny, Pa.
“V. 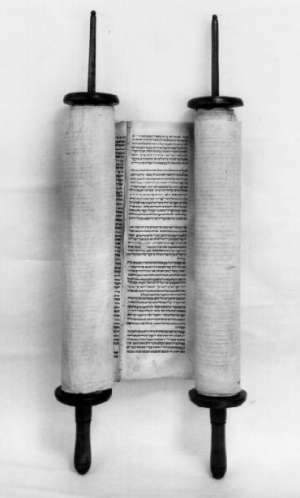 The Psalms in the Service of the Synagogue. It is held that the mode of worship in the early Christian Church was modeled, in general, after the service of the synagogue. Were the Psalms sung in the service of the synagogue? Edersheim contends that there was no praise service whatever in connection with the synagogue. A few others take the same view. Maimonides, Vitringa, Dr. Lightfoot, Ginsburg, The Encyclopedia Biblica, and Cheyne, all of whom are of much higher authority, claim that songs of praise were sung in the service of the synagogue. Our information concerning the origin and the early history of the synagogue is meager indeed. We do not know how and when it originated, though we can with much assurance conjecture. There is no direct statement that there was any singing of praise in its service. Some have held that this lack of positive statement is conclusive that praise formed no part of the service. But when we recall what a prominent place the chanting of Psalms held in the service of the temple, when we recall that praise became a part of the worship of the Christian Church from the very first, and when we recall that Jews, who had all their lives been accustomed to worship in the synagogue, were so familiar with the Psalms that in the mid-night darkness of the prison Paul and Silas sang praises to God, we can scarcely conceive that this prominent and popular part of worship was wholly omitted from the service of the synagogue. (d) The claim of Cheyne, Vitringa, Dr. Lightfoot, The Encylopedia Biblica, Binnie, Killen, Harper, Burbidge, and almost all other authorities, that the “prayer” of the synagogue service included praise. “4. There is no clear evidence that in the second century of our era any songs but those of the inspired and divinely authorized Psalter were used in worship by the orthodox. If songs additional were used, what has become of them? Surely some of them that had been in the mouth of martyrs in that age of persecution must have survived, being treasured in the hearts and memories of fellow-Christians who outlived the scenes of fiery trial. Yet when we ask for them, not one can be produced. Even Dr. Schaff, one of the most erudite ecclesiastical historians and most enthusiastic hymnologists, is forced to admit that from this period no hymn, aside from the Psalms, has come down to us, unless it be some snatches derived from Scripture, especially from the first two chapters of the Gospel according to Luke. I am performing an indepth study on congregational singing and the ancient synagogue. Modern research seems to suggest that there was no singinging. Do you have any modern references to suggest that there was congregational singing in the ancient synagogue? Say from 2005 and up? the idea that prayer included praise seems speculative. The Songs of Zion by Michael Bushell was republished in 2011 and has a significant number of references dealing with the subject of synagogue “worship”. Bushell’s book is hands down the best modern defense of EP. Even if the reader does not agree with his position, the author devotes a great deal of time to answering the opponents of the regulative principle like Gore, Schlissel, Frame, Wilson and Leithart. Bushell’s view is that there is no evidence that the synagogue was a place of worship, which destroys the arguments of the non-RPW crowd who want to say that synagogue worship is a major problem for the EP position. If you are interested in researching this subject, Bushell’s book would be well worth the price. Make sure you get the 2011 edition or later.